Chief judge of Sabah and Sarawak Tan Sri Richard Malanjum today suggested the authorities consider the establishment of a tribunal to look into cases of Native Customary Rights land. He said the courts in Sabah and Sarawak were burdened by NCR land cases which took a long time to settle. "It is a tedious process involving many witnesses and many interpreters due to dialect problems," he said, adding that Sabah alone had over 45 known dialects while Sarawak had more. Addressing the opening of Legal Year 2016 for Sabah and Sarawak at the Sibu Court Complex today, Malanjum said the members of the tribunal should include those knowledgeable in native land claims. One option was to have a reconstituted Bumiputera/Native Court with judges familiar with native land claims and disputes. Twenty new cases were registered in Sarawak last year, with Sibu and Kuching recording the highest number of seven cases each, and Miri and Bintulu, three each. Twenty cases were disposed of last year, with 28 still pending. In Sabah, 10 new cases were registered last year with five still pending. Malanjum said NCR cases involved not only legal issues but also cultural and traditional elements or dimensions where one had to be a historian, an anthropologist, a spiritualist and, at times, a semi-politician when dealing with them. "If the latter two elements are ignored, the natives will be most unhappy and may even perform the 'Miring' ceremony in the court premises, and will not accept any decision of the court even though it may have impeccably followed the law," he said. He also said the Native Court could be accorded the same standing as the Shariah Court and brought under the umbrella of Article 121 (1A) of the Federal Constitution. – Bernama, January 22, 2016. Bersih will join the protest against the Trans-Pacific Partnership Agreement (TPPA) at Dataran Merdeka in Kuala Lumpur on Saturday. The chairperson of the electoral reform movement, Maria Chin Abdullah, vowed that the turnout would be bigger than Bersih 4, which saw tens of thousands taking to the streets last August. "Bersih 2 supports the anti-TPPA protest and urges all supporters of the Bersih 1, 2, 3 and 4 rallies to join us at Dataran Merdeka on Saturday. "Malaysians must fight against any attempt, foreign or domestic, to challenge the sovereign right of the rakyat to determine our future," Maria said. "This will be a much bigger crowd (than Bersih 4)," she later added. 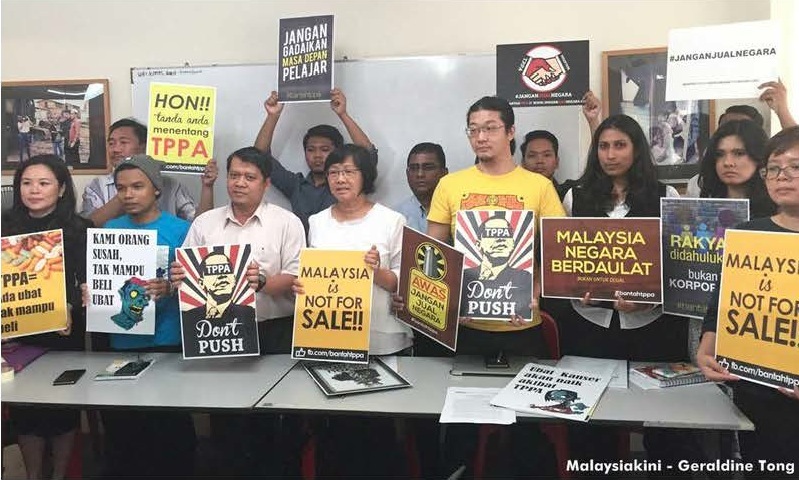 The anti-TPPA protest, organised by NGO coalition Bantah TPPA, has already garnered support from opposition parties such as PAS and PSM, which are mobilising their members to take part. "We welcome the support from Bersih," Bantah TPPA deputy chairperson Azlan Awang told a press conference in Petaling Jaya today. Among those in attendance, other than Bersih officials, were representatives from National Human Rights Society (Hakam), Tenaganita and Institute Rakyat. Azlan (photo) said the coalition is hoping for a massive turnout at the three-hour protest, which will commence at 2pm. He also revealed they have given the police notice of the protest 10 days in advance, as required by the Peaceful Assembly Act. He said the organisers met with Dang Wangi district police chief Zainol Samah twice, and promised there would be no march. "The police are mindful of events that might lead to undesirable situations, so we will cooperate with them," he added. Therefore, Azlan advised any group that planned to march to the protest site at Dataran Merdeka to refrain from doing so. Meanwhile, Bantah TPPA is still trying to obtain permission from Kuala Lumpur City Hall (DBKL) to use Dataran Merdeka for its protest. However, Azlan said, the organisers have planned activities during the protest, such as speeches from prominent political figures and NGO leaders. The TPPA is a multinational free trade agreement in which the United States is a main proponent. Apart from Malaysia, other countries involved in its secretive negotiations included Australia, New Zealand, Vietnam, Mexico and Canada. Critics fear that the TPPA would wipe out local businesses, as well as threaten Malaysia’s sovereignty due to a clause allowing foreign corporations to sue the government for actions that result in loss of profits. Parliament will debate on whether or not to sign the pact during a special two-day session of the Dewan Rakyat on Jan 26 and 27. On many occasions I have tended to agree with the Chief Minister’s statements pertaining to the rights of Sarawakians but I find his latest jibe at the opposition in the matter of keeping out Semenanjung Malaysia based parties rather insincere and silly. He is taking such delight in gloating over his ‘clever’ reply in the recent DUN sitting that I hate to burst his bubble - but necessity compels. Firstly, although the Chief Minister has not said so, he does not have the power to restrict the registration of UMNO or any other political party in any part of the federation under the laws of Malaysia. He is conveniently letting the public labour under the misconception that he does have such power. Secondly, it is common knowledge that for his own political expediency, he cannot allow UMNO to come into Sarawak as the state BN is ruling the state in the form of PBB and its partners. Allowing the powerful UMNO into Sarawak would dilute his influence within the state BN and loosen his control over the state. By saying ‘not allowing’, we mean that there is an understanding between the state BN and UMNO that as long as PBB and its partners hold the majority of seats in Sarawak, UMNO will not set up officially in Sarawak. In the case of Sabah, when BN proxy PBS withdrew from BN 5 days before the 1990 general elections and went on to win 14 out of the 20 seats, Dr Mahathir immediately sent UMNO into Sabah. It is clear that as long as the Sarawak BN proxies remain meek and mild, and continue to welcome their visiting top UMNO leaders with tight embraces, UMNO will not set up shop here. After all, UMNO does not need to do so as they are effectively ruling the state through their PBB and other BN proxies. To keep them happy and loyal, the extra incentives for the state BN’s parties include 7 ministerial and 3 deputy ministerial posts in the PM’s cabinet (PBB 7, PRS 2, SUPP 1). The Chief Minister has been riding high on the Sarawak for Sarawakians sentiment for many months, echoing the unhappiness of Sarawakians over the failure of the BN federal government over the past 50+ years to safeguard our interests and facilitate the development promised. However, he has proven to be ineffective. When asked to declare the fact that Sarawak has no official religion, he remained silent, perhaps for fear of offending his leaders at the United Malay National Organisation. Our demands for increased oil royalty and the recognition of the UEC were rejected, and the use of the English language was met with either criticism or a deafening silence from the BN politicians. It is rather pointless to ask Sarawakians for 5 more years when it will be 5 more years of just being ignored. The burning and relevant question for the Chief Minister is this: given that we have been sidelined and exploited by the federal BN government for half a century, and given that his voice has been embarrassingly unheard by them, is he willing to gather up his remaining gumption and leave the BN coalition? Will he be brave and bold and have the PBB stand on their own against the exploiters of Sarawak and Sarawakians? He will have to make his stand clear very soon. Failing which, please stop this nonsensical debate of stopping UMNO and Semenanjung based political parties from coming to Sarawak. The pertinent question for all Sarawakians is this: Who are the politicians who first reminded Sarawakians of their forgotten rights that were guaranteed under the Malaysia agreement? Who are the politicians who have been fighting for the rights of Sarawakian and Malaysian natives? It is the opposition, especially PKR that has fought for Sarawakians, in particular for our natives’ rights, among which are the rights to their customary land known as the “pemakai menoa” and “pulau galau” concepts for the Dayaks and “cari makan” land for the Malays. These concepts have clearly been rejected by the Chief Minister and even by the native BN leaders in Sarawak. Why pretend to be champions vis-a vis the Federal Government when at home, you refuse to recognise our rights to our lands and our livelihood? This is the most basic and fundamental right, which has been declared to be equivalent to the right to life by the Courts in this country. So, the issue is not about making the opposition look stupid in DUN, it is about these questions which the Chief Minister has to contemplate and iron out in his mind. He has to make his stand clear. If he wants to be the champion of Sarawak for Sarawakians against our exploiters the Federal BN politicians, he cannot continue to associate with them and embrace them so fervently. He cannot have his cake and eat it too.